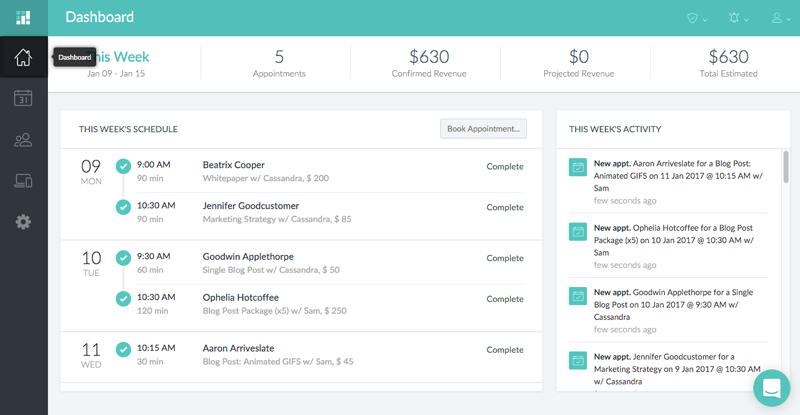 The dashboard in Setmore helps you keep track of your weekly appointments and revenue. It displays appointments and aggregated income stats for all of your team members for the current week, and is intended to give you an at-a-glance status update about your business. The top bar displays the current week, total appointments and revenue projections for the week. "Confirmed Revenue" is the revenue from all appointments that have already occurred this week. "Projected Revenue" is the revenue from all appointments that have yet to happen this week. And lastly, "Total Estimated" is the sum of the previous two figures, and should equal your total revenue by week's end. "This Week's Schedule" displays all past and future appointments of all staff members for the entire week. You can click an appointment to bring up its Appointment Details menu. From here you can edit, reschedule, or cancel the appointment as needed.